Flash Gordon was created by Alex Raymond back in the 1930’s as a direct competitor to the hugely popular Buck Rogers . The character quickly became a hit in his own right due to beautifully illustrated strips full of action, fantastic science fiction backdrops and a healthy does of sexuality. The artwork was unique in that it wasn’t inspired by the cartoonish images that filled most newspaper strips of the time. There was a realism to the art that brought the character to life in a way unlike any other. This gorgeous, hardcover book collects all of the Sunday strips from January 1, 1934 through April 18, 1937 into one volume. Comic enthusiasts, particularly those with a love for the vintage look and feel of the era, will be immediately drawn in by the style of these strips. Although the collection of strips alone is enough to recommend the book, there is more to this 200-page book that just the reprinted strips. It includes a beautiful selection of black and white line art that has never before been seen as well as images from the movies, television and daily life of its creator. Along with these images is a brief but informative history of how Alex Raymond came to be the man that created Flash Gordon. It describes his youth, his love of drawing and how historical events like World War I and personal tragedies like the death of his Father helped direct his career. All of these details make reading the strips that much more interesting. Once the person behind them, and the world in which he lived, becomes more real, the strips suddenly seem more relevant and more insightful than they would on their own. 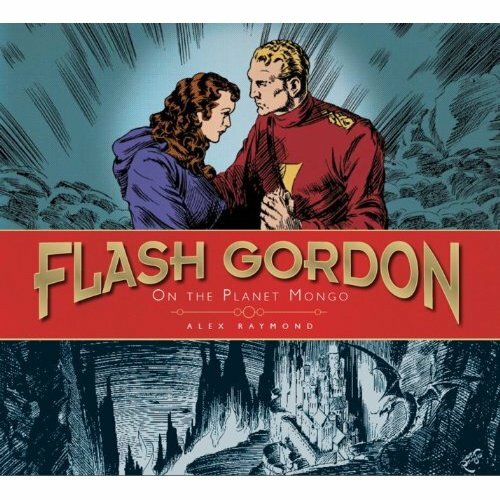 The Complete Flash Gordon, Volume One: On The Planet Mongo ($39.95) is now available and will be a treasured edition to any comic fan’s collection. Volume Two: The Tyrant of Mongo will be available in December and Volume Three: The Fall of Ming arrives in March which will complete the collection of Alex Raymond strips.